Sewerway - The Chip's Challenge Wiki - The Chip's Challenge Database that anyone can edit! Don't waste blocks. You will need all of them. 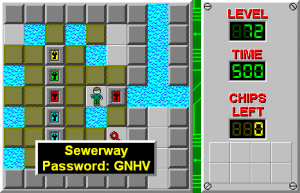 Sewerway is the 72nd level in Chip's Challenge Level Pack 4. It was created by Archie Pusaka.